PaveCo, in Hollywood Florida, is a paving company specializing in sealcoating, asphalt, concrete and overall parking lot maintenance that wants to make people’s lives smoother. Most people consider redesigning and redoing the interiors of their businesses in order to make it comfortable, safe and aesthetically pleasing for their customers, but many fail to realize that the actual very first impression of a company is their parking lot. It is where the clients and staff first set foot. Yet, this area tends to get neglected. There are numerous reasons why parking lot maintenance shouldn’t be ignored such as, safety, liability, ADA compliance and overall functionality and aesthetics. Did you know that imperfections in the concrete or asphalt is a leading cause of parking lot accidents? If an accident occurs in a parking lot due to a crack or pot hole in the concrete or asphalt, the company could be liable and held responsible to any injury to the people or vehicles. Pedestrians could trip or fall, causing injury, which once again the company could be liable. This is while paving and sealcoating to make sure there are no bumps, breaks, or cracks, is crucial. Parking lots have to pass inspections in order to be considered safe and ADA compliant. There must be highly visible markings and signage that are securely anchored into the pavement. Customers/clients/staff must be able to easily see lines, markings or any other sort of signage in order for your parking lot to pass inspection. There also cannot be pot holes are large cracks that could cause injury. It’s crucial to maintain your lot with preventative and quality care. Having a parking lot resurfaced isn’t only important for safety reasons, it also shows pride and care in your company. A well maintained lot is inviting and attractive. It displays value and quality in your company. If a potential customer/client has an option to go to company A who’s lot is ugly and filled with pot holes or company B, who’s lot is maintained and smooth, they would most likely choose company A. Or, if a customer/client pulls into your lots and gets a flat tire or trips and falls, the likelihood of their return is slim to none. The same way we make sure our interiors are clean and inviting, its just as important to make sure our exteriors are as well. Parking lot maintenance is something that must be addressed at any property. Don’t let your parking lot become an eye sore or a parking battle ground. Spending a small amount of money to maintain your paving or sealcoat and prevent large spending later. Get some estimates, and remember that cheaper does not always mean better. Research the company for quality. It will pay off in the long run. 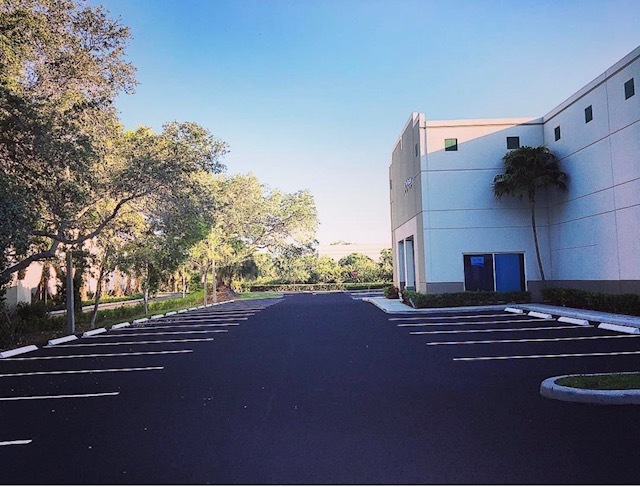 At PaveCo, a paving and asphalt company, located in Hollywood Florida, it is our duty to our customers to provide honest, cost-effective solutions for your parking lot needs. PaveCo is dependable and values every customer. We strive to keep an open and lasting relationship with every customer, even when the project is completed.